Despite moving at -what is for me - an unimaginably slow sewing pace, the Oriental New York Beauty blocks are progressing nicely. I picked up a light cream piece at Dayle's which helps liven up the darker gold background in the alternate blocks. There are only four more of these blocks left to piece before moving on to a different one for the centre. After each block is completed, I add it to the group and take the pile to the design wall to play with different layouts. I love twisting and turning them in all directions to see the various effects. The sewing would be moving along much more quickly without this diversion...but it wouldn't be near as much fun. This weekend while visiting the bees, we decided to take the plunge and open a hive. They are still in their winter wraps as it's a bit cold yet to remove the insulation. As I write this morning, it's a chilly -6° C. We were thrilled to see so many bees in the top box and that they still have lots of honey in the frames. Hubby decided to take a plunge of a different sort... ...and plunged his bare hand down to take some comb off the side wall. Yes, he is fearless. 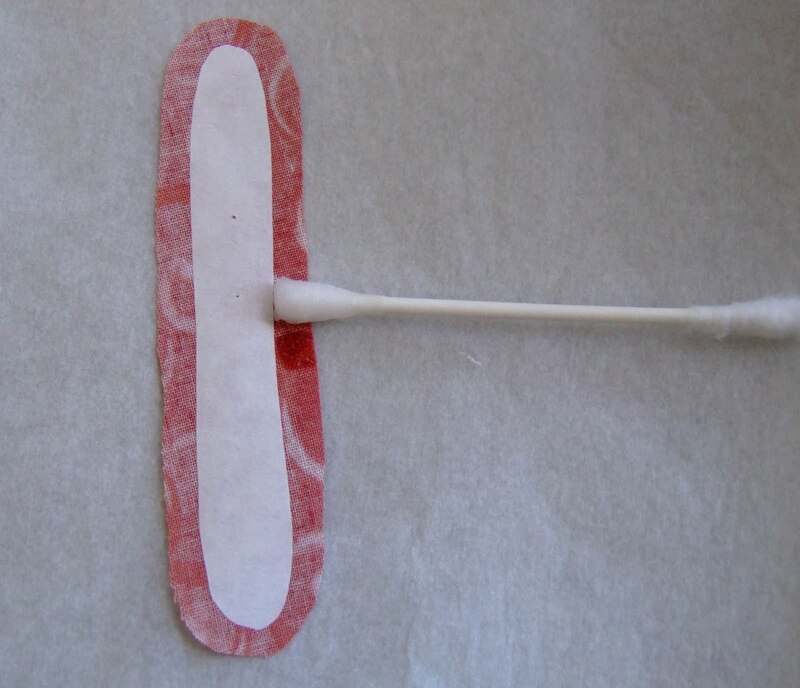 Man, that's sticky!! In all, we opened three hives and were greeted with pretty much the same findings in each: lots of bees and lots for them to eat. We carefully closed the hives back up and put the insulation in place. It won't be long before it comes off for the season, but there are still some cold nights for the next couple of weeks. No point rushing it. Back in the sewing room, the box of Oriental fabrics in my closet has been calling me to come and play. Last week I ironed the entire box, which is something I really enjoy. It's part of the design process for me, an up close and personal time of reflection with the fabric. Because I have made several quilts already from this stash, I am left with odds and ends and many small pieces. It took awhile to get the colours just right. Saturday I sewed and ripped and resewed a New York Beauty block four times as one of the colour bands just wasn't working. I am much happier with blue for the band, as it will make a distinct line of colour up the edge of the quilt. These fabrics are Oriental Treasures by Robert Kaufman, one of my all time favourite lines. 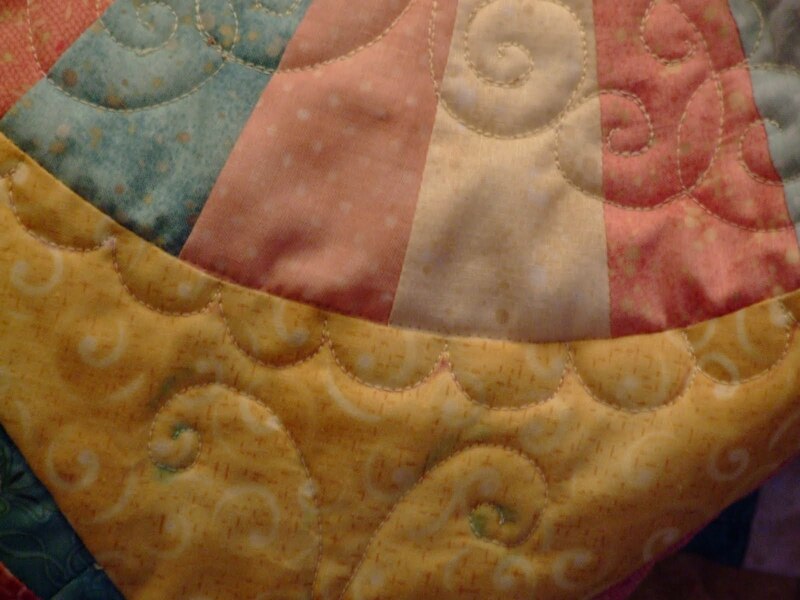 The best part of quilting is the wonderful people you meet along the way. Last year I had the pleasure of meeting an enthusiastic and peripatetic group from Shelburne, N.S. They are always on the go! This picture came yesterday from Sheila who is enjoying an extended travel adventure. 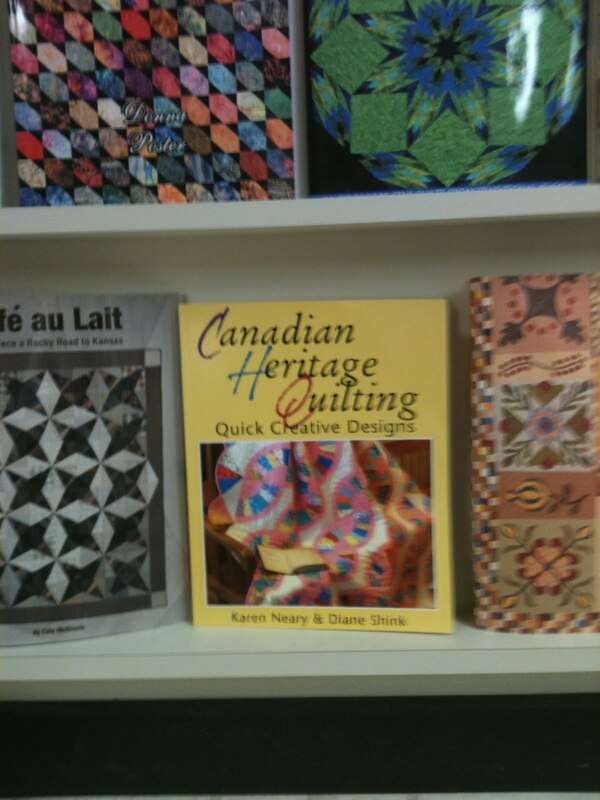 She stopped into the Quilt Museum in Paducah and spotted our book. I really appreciate seeing it, and in such good company on the shelf. Thanks, Sheila. There have been some travellers coming north also. 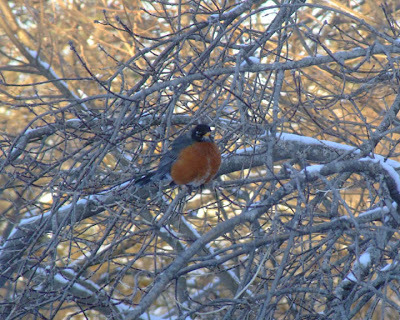 Although technically there have been robins here all winter, their numbers have increased substantially this past week. 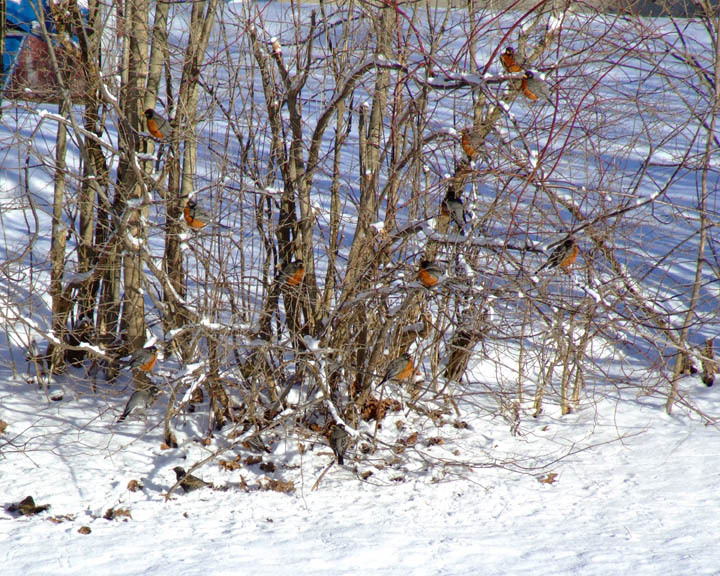 These fellows are gathered for a meeting in our backyard, no doubt discussing last night's snowfall and wondering if they turned up the wrong page on the calendar. "Kay S.", will you kindly email so I can say a proper thanks for your kind deed in posting my site? I lost your email address (along with most others!) in the big crash of 1/11. Aren't they festive? I find string blocks so appealing. 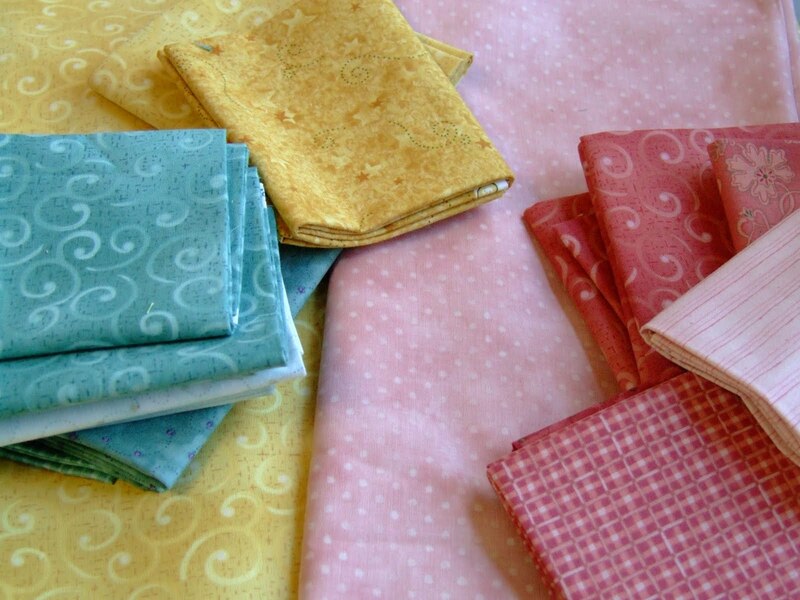 Because of all the scraps, there are never two alike and as Rosa notes, varying the width of the strips too can give a totally new look. They are a wonderful way to use up little leftover bits that don't fit anywhere else. 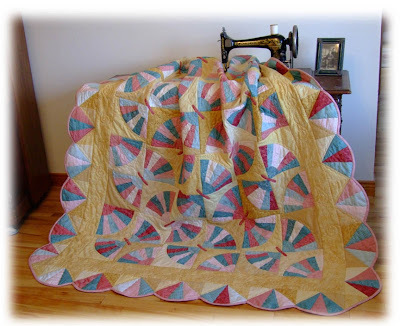 Check out Linda's new string quilt here. 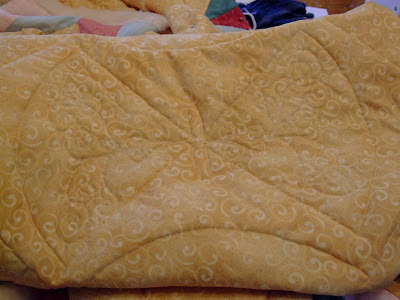 Rosa writes that once these are quilted, she is making two more sets as her neighbour saw them and wants a set too. (isn't that how it goes?! :) Rosa, I wish I were as efficient as you in getting Christmas things sewn in March. Great job! I hope you will send pictures of your next ones to share also. What a difference a week makes! 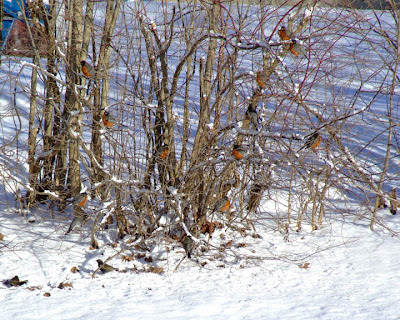 Seven short days ago hubby and I snowshoed in to visit the beehives. After several mild days of melt and rain, we were forced to switch out to rubber boots for today's visit. The fields en route to the apiary are flooded. Not sure how the farmer will reach this hay barn as the road is completely underwater. See that little stick in the foreground? That's the top of a fence post, near the side of the road. We were faced with a very soggy, mucky field and decided the best way in was through a wooded area. This involved climbing over a wire fence...thankfully, not barbed wire. I admit I am the poster child for clumsy; it wasn't a pretty maneuver, but it worked. We were greeted with a very happy sight when we reached the hives. Can you see what we are seeing? Isn't that a happy buzz?! Every hive is alive and active which is pretty wonderful after the winter we've had. 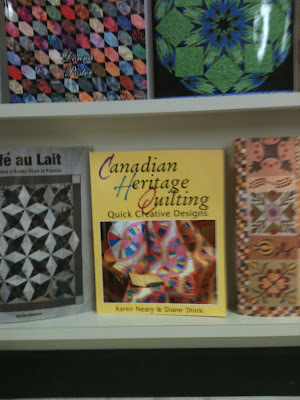 Houston, Paducah, Quilt Canada: Somebody Pinch Me! This has been some week...First, With Glowing Hearts was shipped off to Houston where it will join the travelling exhibit "O Canada". This show opens at Spring International Quilt Festival in Cincinnati. 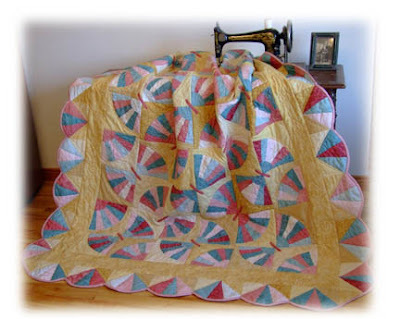 With Glowing Hearts is also currently part of a fun online exhibit through The Canadian Quilter's Association. If you feel inclined to vote, my "With Glowing Hearts" is #22, you can scroll to the bottom to click "yes" and keep scrolling to click "submit". Voting continues to March 20 and is just for fun. 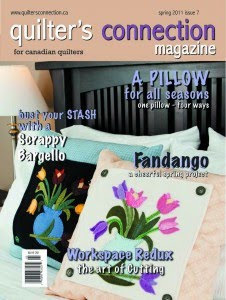 Yesterday, my copy of Quilter's Connection magazine arrived with a really lovely presentation of my quilt Fandango. Today...the mailman brought two large, manila envelopes which contained more good news than I ever dared hope for. I have a quilt accepted into the National Juried Show at Quilt Canada in London Ontario and also one which is a semi-finalist at the AQS show in PADUCAH! On Monday of this week, "With Glowing Hearts" was shipped off to Houston where it will become part of the travelling "O Canada" quilt exhibit this year. Hubby and I had fun shooting these pictures on a very windy day at Fort Beausejour, New Brunswick in the summer. This quilt was designed to celebrate our Canadian heritage inspired by a line from our national anthem, O Canada: "With Glowing Hearts, We See Thee Rise". Pieced hearts are linked in the fashion of Olympic rings with the colours chosen to represent blue for our water, sky and French heritage; black for Cape Breton coal and Alberta oil; red for the maple leaf on our flag; green for our lush forests; golden tan for wheat, maple syrup and Yukon gold. The background fabric, designed by Robyn Pandolph, and features printed words to O Canada. Maples leaves and fleur-de-lis motifs are quilted in, along with the words "With Glowing Hearts We See Thee Rise" stitched in the bottom border. "With Glowing Hearts" also appears in a fun online promotion by The Canadian Quilter's Association. You can see several quilts with patriotic themes posted here. If you feel inclined to vote, my "With Glowing Hearts" is #22, you can scroll to the bottom to click "yes" and keep scrolling to click "submit". Voting continues to March 20 and is just for fun. Today the mailman brought the spring issue of Quilter's Connection magazine. Editor Heather MacArthur has put together a very interesting issue. 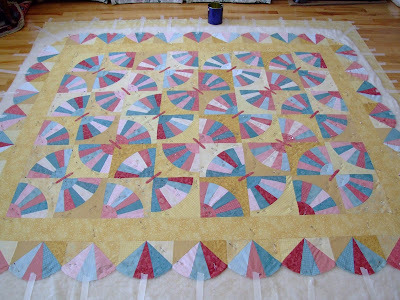 One of the projects featured is my Fandango quilt, which I have shown snippets of here while it was in progress. Now I am pleased to be able to show the whole thing. It is pictured here spread out on my great-grandmother Christina Patterson's treadle machine. The soft palette chosen for the old-fashioned fan blocks are from Benartex's Forever Spring collection, designed by Nancy Halvorson. The fans are set together in diagonal pairs to form butterfly wings. 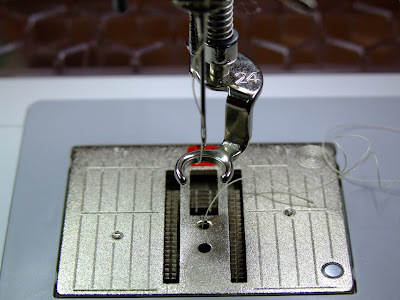 I love sewing curves, and my little secret to keeping the blocks true is to pin not just along the curve where you stitch, but also at each end to keep the background piece square to the edge of the blades. I use this method to sew my New York Beauty blocks as well and find that they come out (dare I say it?) perfect each time. 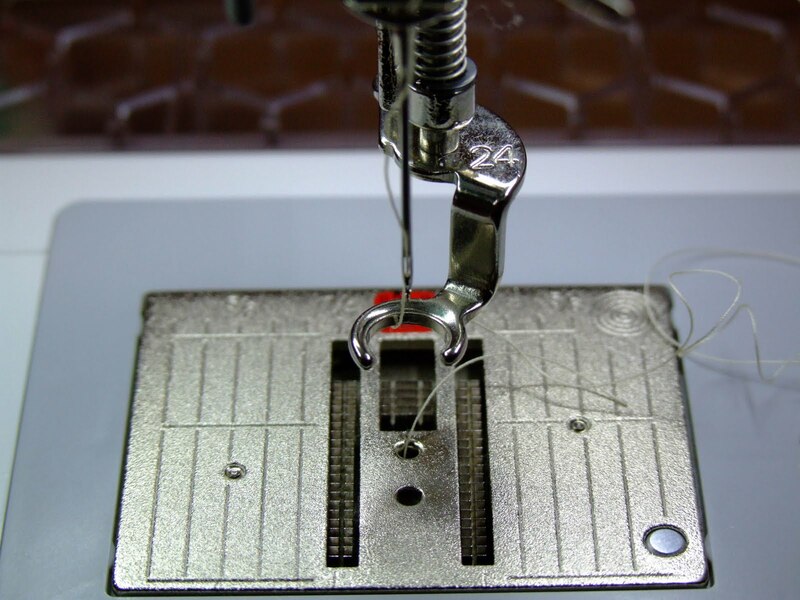 You will notice a row of stay-stitching on the lower curve, and that's another little trick to keep your curves smooth. The top curved edge of the fan blades (under those pins) has also been stay-stitched before this background piece was added, about 1/8" from the edge. 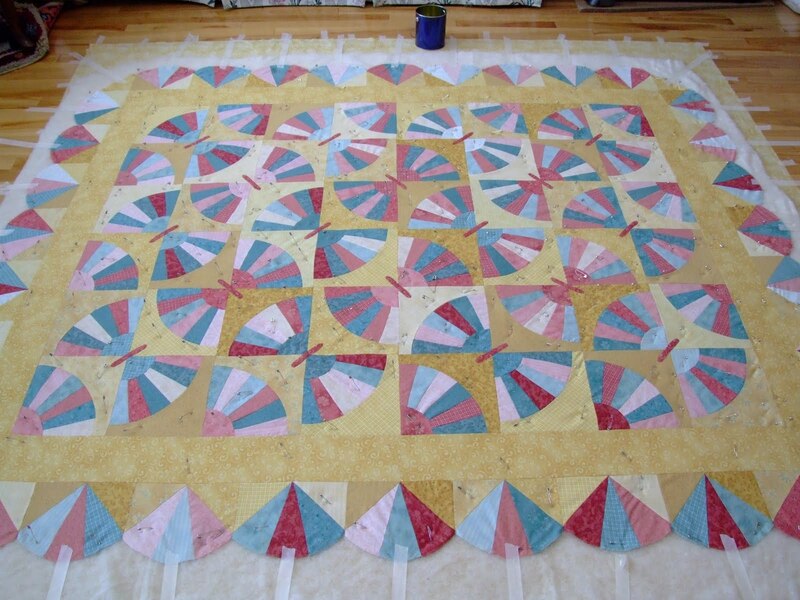 After the centres and background sections are added to the fans, each block is numbered and lettered to show the final placement in the quilt. The butterfly bodies which are added by appliqué are simple to make, using freezer paper and starch to turn under the edges. 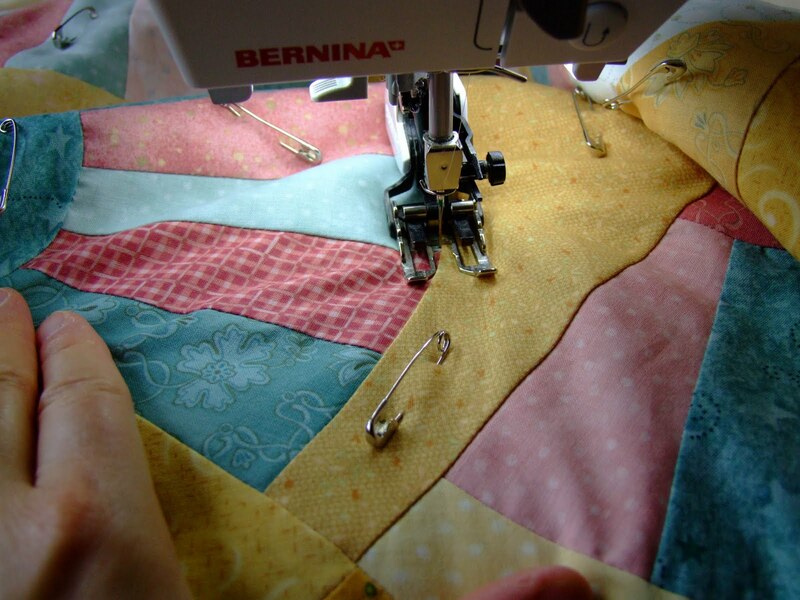 They are sewn to the quilt using invisible thread and a blind hem stitch. Fast and easy! Basting is never fast and easy, as I spread the quilt on the floor and use safety pins. Masking tape holds all the edges taut and smooth before I begin pinning. The salvation for this chore is music, which needs to be loud enough to drown out my singing while I work...! When I move the quilt onto the machine, the first part of the quilting is with the walking foot on. 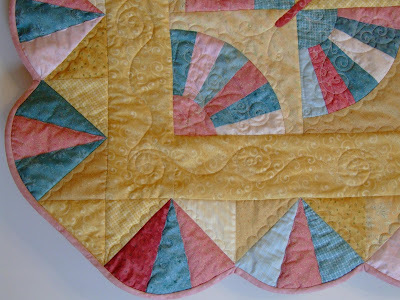 I outline all of the blocks and patches which form the design. 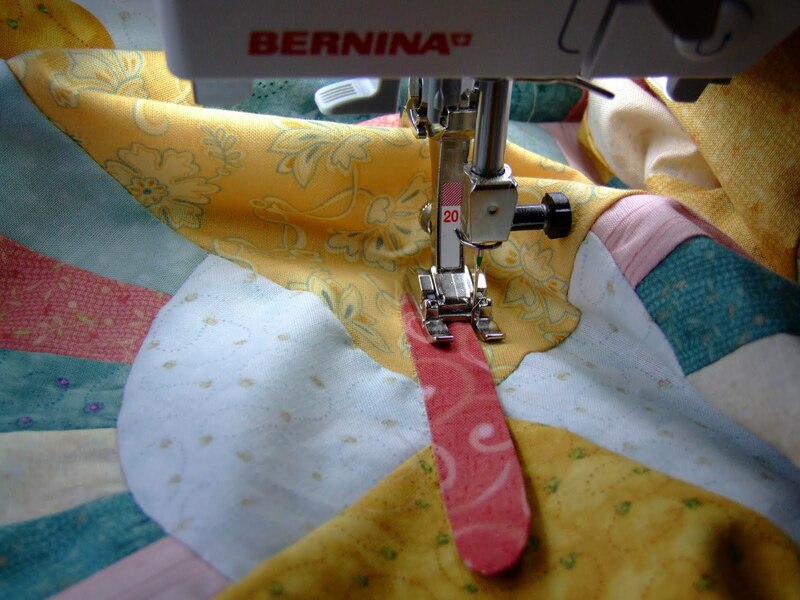 We often hear that our work should look as neat on the back as on the front, and this applies to machine quilting as well. Outlining the patches makes the design discernible from the back, which it otherwise would not be if the quilting were only done to highlight various areas on the front. 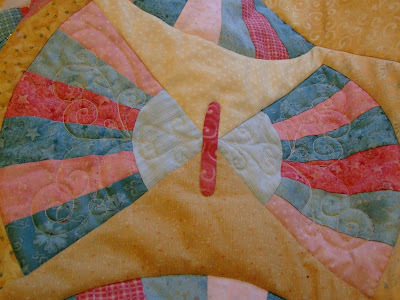 Once the quilt is secured with this outline stitching, the safety pins are removed and the fun begins. Without the quilting, these are merely fan blocks with an oval appliquéd between. Much as a butterfly emerges from a cocoon, these fan blocks morph into butterflies with the help of thread. 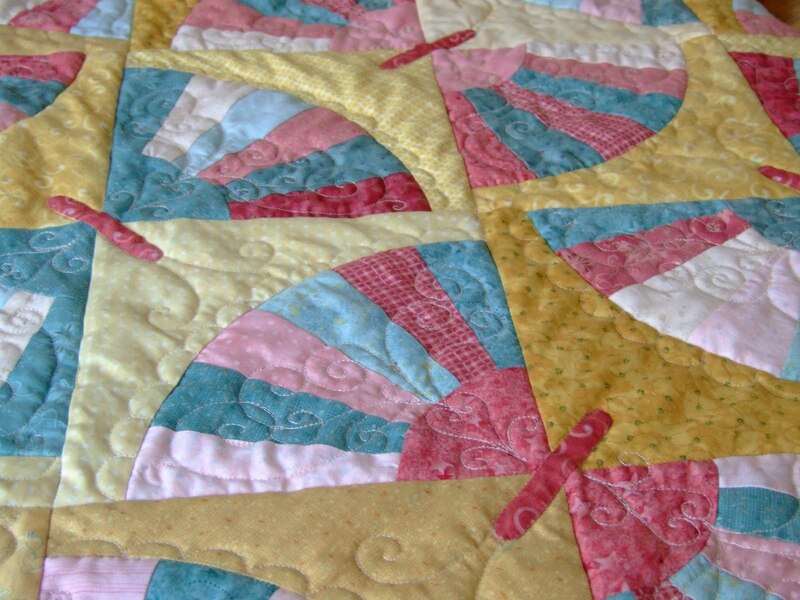 I wanted the quilting to be soft and light and springy so I chose curlicues to give a filigree look. Antennae were stitched at the end of each butterfly. A scalloped border of fan blades was added to the outer edge. 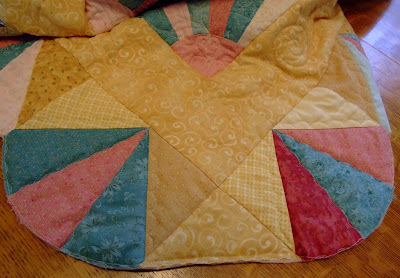 Using a triangle at the corners made for easy turning...and binding. 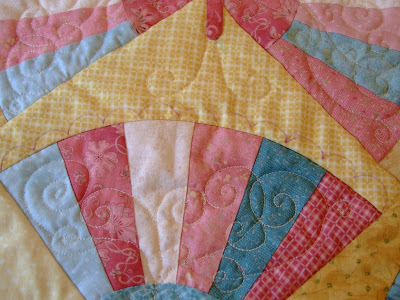 Heather MacArthur added a bonus tutorial in the magazine with instruction on how to make bias binding. Another bonus is that this pattern is Fat Quarter friendly, so if you have been collecting F.Q. 's, this is a great pattern for their use. ...or more correctly, "bees happy". We've had mild weather for a few days so hubby and I decided to combine a final snowshoe trial with a visit to the winter beeyard. We parked and began our hike into the field. Looking back, it appeared Big Foot was close on our heels! Though mild today, the wind is strong and these fir trees are bending with each gust. As we approached, we saw tell-tale dark speckles on the snow. We knew what that meant. The snow was littered with the bodies of bees who did not survive the winter cold. Fortunately, many did survive and were out today flying in the fresh air. 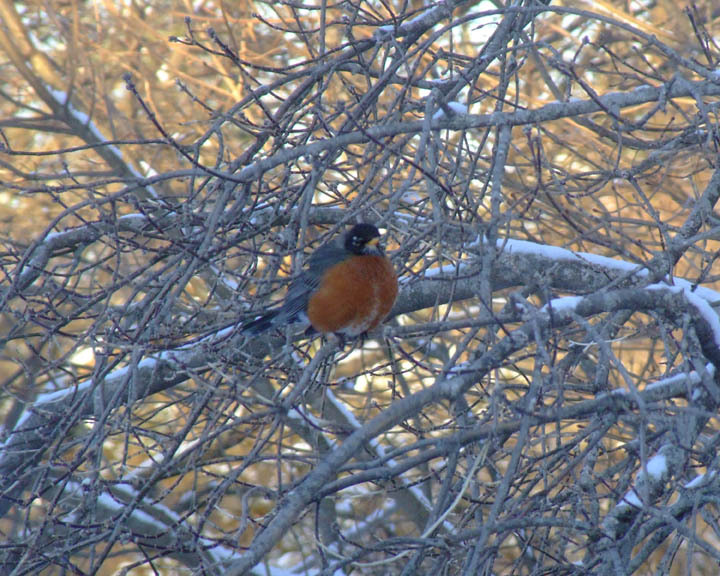 The snow is melting rapidly in the mild weather we've enjoyed this weekend. Here's the shed today. Contrast this with a picture posted here a week ago to see how much the snow has gone down.